Hello everyone and welcome to the next tutorial in this series which prepares you to be a great SAP HANA Consultant. Today, we learn how to create an SAP Business Objects OLAP connection. This is usually an administrator’s task and in all probabilities, if you are a developer would not have to do this. A developer would just need to use this SAP business objects OLAP connection to connect to his/her views in HANA. So if you are an administrator reading this, you better pay attention. If you are a developer, you can skip this one if you want to but it’s better to know for informational purposes. As mentioned earlier, different SAP Business Objects tools require different ways of communication with the HANA databases. Many of them can use an OLAP connection and this makes it one of the more important connection types. 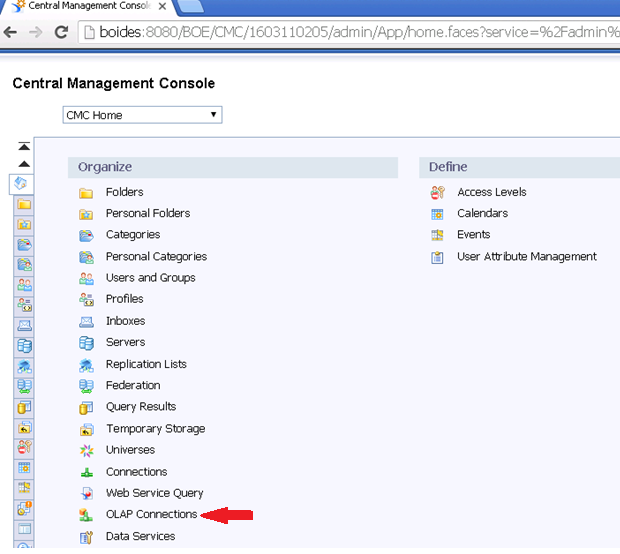 Since this is an admin task, we need to open the Central Management console or the CMC which is the link administrators use to handle system configurations and user management. Developers ideally don’t use this link much and would not have access to it. The below link would take you to the CMC. 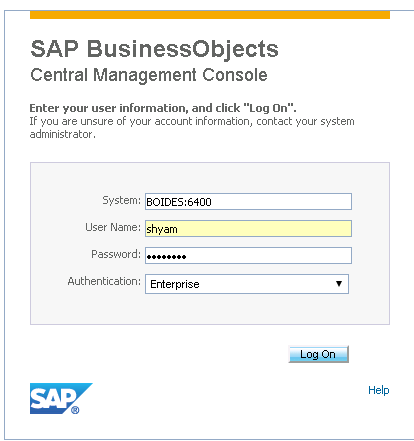 Replace <hostname> with the SAP Business Objects hostname of the system you are working on. We launch it in chrome in this example. The next step is to key in your login details. Again, this varies based on your project setup. Once your user IDs are set up, your Security team would be able to provide you these details. The CMS looks like the below. There’s lot of do here but we only want to create an OLAP connection right now. Click on OLAP connections. This takes you to the list of folders you have in you have here under which your connections are grouped. If you need to create a new folder, click on the new folder button marked below. But in this case here we use an existing folder 0TEACHMEHANA. Double click to go inside this folder. It is currently empty as seen below. Press on the new connection button to create a new one. This opens up a form where you fill up the connection details. There are a lot of entries to be done here but let’s take it one by one. 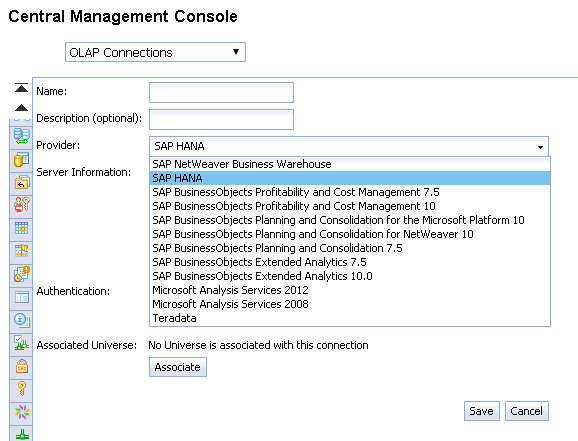 Firstly, in the “Provider” drop down, select the source as “SAP HANA”. 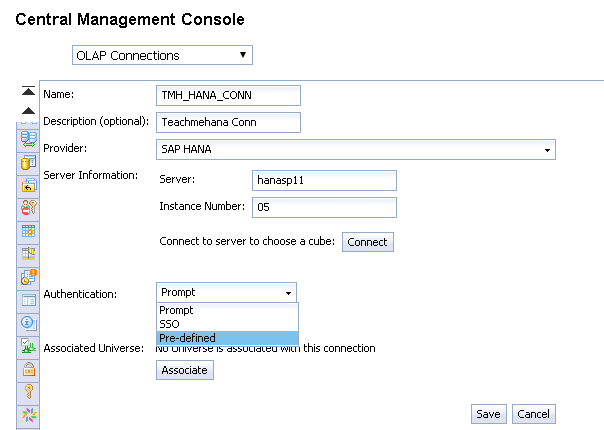 This slightly changes the form and it now asks for the server name and instance number of your SAP HANA database. Now, fill out all the details. Give this connection a technical name like TMH_HANA_CONN as provided below. 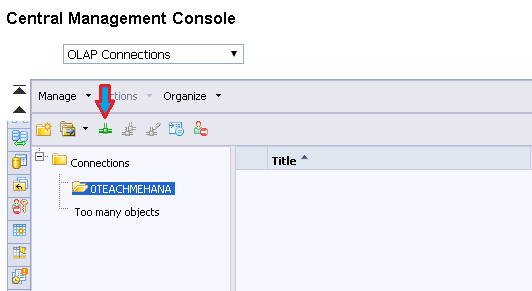 Also give it a description and the HANA database connection parameter which you ideally should already have since you came in planned to connect to it. The authentication can be done in different ways. Choose one based on your requirement. Prompt: If selected, the username used to access the SAP HANA database would be asked every time the report is refreshed by the user. Pre-Defined: If selected, you would provide a username in this screen itself and all then irrespective of the user, this singular username would be used to access the HANA database. SSO (Single Sign On): If selected, the SSO captures the user’s HANA credentials from the SAP BO user ID and on refreshing the report, the user gets prompted for the password. In this example, we provide a pre-defined user and hence have to provide the username and password as well. 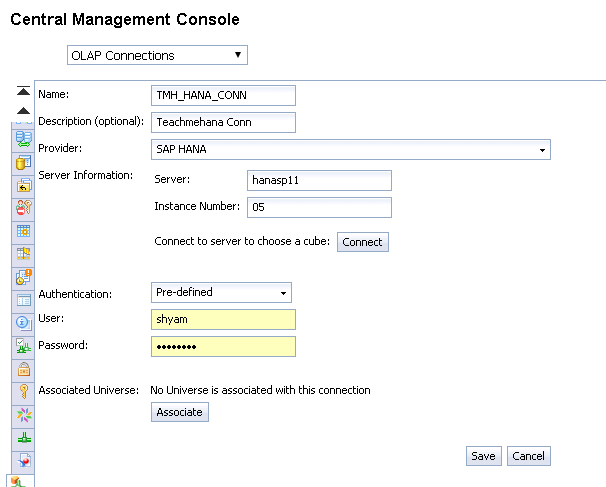 Every user that accesses HANA via any report using this OLAP connection would use this username to go into the database. 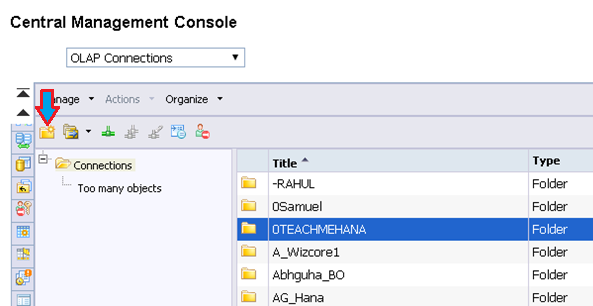 This completes the new SAP Business Objects OLAP connection TMH_HANA_CONN. 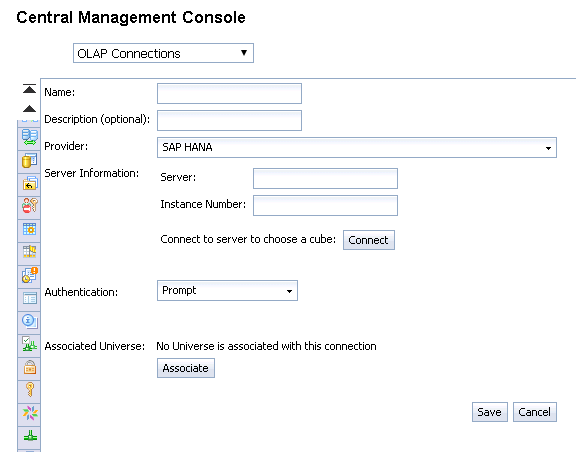 Now, any SAP BO tools that support OLAP connectivity can use this connection to access views on HANA. 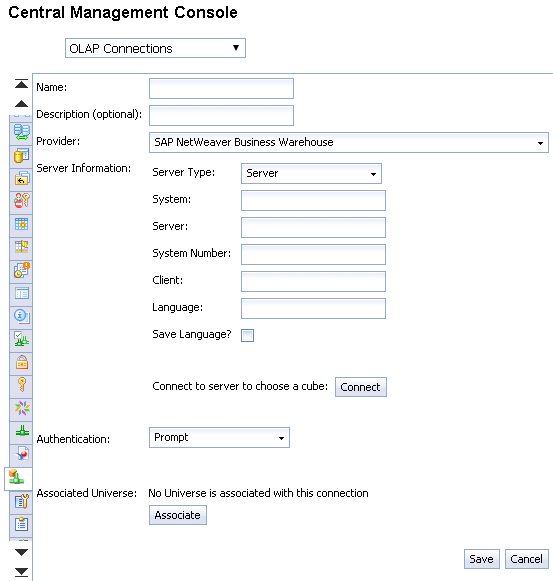 Hopefully, the SAP Business Objects OLAP connection creation process is clear to you. Join us in our further tutorials to continue our journey on reporting tools with HANA. Be sure to share this tutorial on social media to show your support.